A 1200-page book (small print, hardcover) is a challenge, especially when it’s a book like Ayn Rand’s Atlas Shrugged. But everyone kept telling me to read it—you have to read it, Sara—so Santa brought it for Christmas. Santa: I’m not entirely thankful. 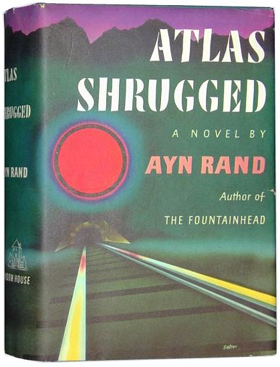 Atlas Shrugged is Rand’s fourth and final novel. She considers it her magnum opus. At literally 1168 pages, it better be. Published in 1957, it received mostly negative reviews, but somehow it has survived into a modern era, where even most pop culture novices have heard the phrase “Who is John Galt?” Last year, the first half of the novel was brought to the big screen. Part Two will follow this year, although Part One got panned, so I doubt I’ll sit through either, especially since I read the book, and damn it, I need a break. What’s the plot? Hell if I know. 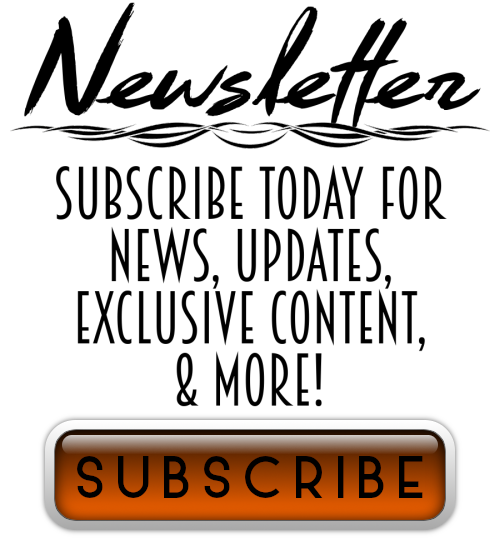 Okay, it’s about Dagny Taggart—a heroine with some guts. She runs a transcontinental railroad when the story gets rolling. Everything could have been hunky-dory, if not for the government getting involved. The problem starts in a small automobile company. The owners suggest that workers will no longer get paid by tenure or ability; instead, they will get paid based on their “need.” Pregnant wife? You get more money. Sick parent? You get more money. Culture devolves from here, and soon, Dagny has to worry, because industry is put under the same rules. Somebody with a friend in Washington needs oranges in Idaho? Okay, screw the anti-social guy who needs steel in Colorado; we need to send oranges to Idaho! Soon, all the brilliant people begin to disappear, burning their businesses to the ground before they leave. Where are they going? Will the world survive their loss? Will the stupid government a$$holes get what they deserve? You have to read—all 1168 pages—to find out. I’ve never read Ayn Rand before, so maybe I should have warmed up on something a bit smaller, like Fountainhead. However, since I’m a speed-reader, I thought, why not? Why not Atlas Shrugged? Well, it took me two months and countless headaches. Let us consider the good, the bad, and the ugly. The good? 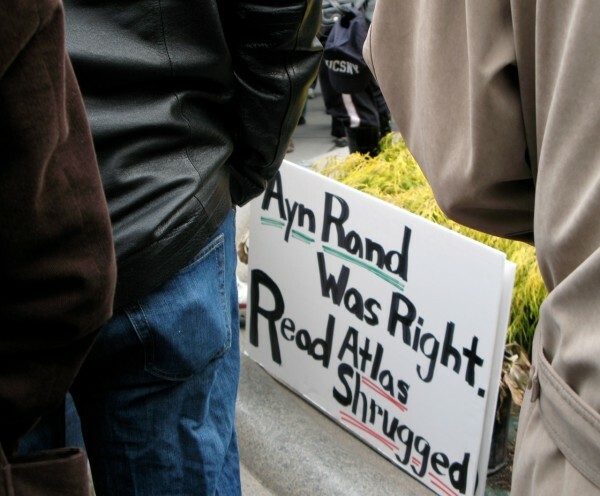 Atlas Shrugged is undeniably important—the problems, conflicts, and ideals it portends. It’s downright creepy how spot-on Rand was back in 1957. What she foresees in the world of Dagny Taggart is slowly becoming the world where we live today, and it’s scary. I had nights when I couldn’t read, because I would get so angry, I wouldn’t be able to sleep. Right now, typing, my chest grows tight at the thought of what Atlas Shrugged suggests. In this—the message itself—Rand’s opus is a must-read, because only our knowledge and strength of character can save us from a future akin to Dagny’s hell on earth. HOWEVER. I haven’t discussed the bad/ugly. Rand’s writing is so slow-moving and convoluted, I could have skipped half the book and still felt just as enlightened in the end. I know critics will argue me on this point. People who love the book down to their toes will say, “Oh, no, it was all important. Every word. Every phrase. Ever speech.” Speaking of speeches? There’s a 90-page speech that could have been cut down to about 30! In college, I was taught to respect my reader’s intelligence by not over-telling. Rand did not learn this lesson, obviously, because she treats her readers like the uneducated government employees she depicts. It was so frustrating, I sometimes wanted to quit. I didn’t, of course, because I no longer want people to tell me that I have to read Atlas Shrugged. I kept on going. My concern is that Rand was using all those big words just to massage her own ego: Oh, Ayn, you’re such a lovely writer. You’re so brilliant and educated. Oh, yesssss …. More words. More! Or maybe she’s just too smart for me. For the next three months, I will be reading fluff literature and avoiding the news. Ayn Rand may have been a prophet. The message of Atlas Shrugged should be taught in every school, to every demographic nationwide, because it is PRICELESS and IMPORTANT. That said, I do not suggest you read Atlas Shrugged. Please save yourself the trouble, and (gulp—you’re going to hate me for this) read the Cliff’s Notes. Yes, Rand left us with a big ol’ book with a truly imperative agenda. The end results are invigorating. I did feel hopeful—and fearful of our country’s future. When I watch the news and hear about little girls being penalized for selling lemonade without a permit, I want to disappear with all the smart people, too. However, I can’t; not yet. It’s not bad enough out there yet, is it, Ayn? Is it? Oh well. Who is John Galt? Not a fan of her philosophy or her prose. But this is a book full of ideas, and you get a medal for plowing through. You are so right. I want my medal, dang it. Where’s my medal?? After 3 months of fluff, you will be ready for The Handmaiden’s Tale by Margaret Atwood, about a country where almost all women are forbidden to read! It is terrifying and compelling and provocative. Oh, and half the size of Atlas Shrugged. Thanks for this review. Where were you when I needed it, when I read it in the 80’s? Hi Sarah, Surprise, surprise! Is Ayn wordy? Are lots of grains on a sandy beach? Her ‘opus’ was one that certainly could have been done with less words. I personally think she forgot how much time it takes to develop concise writing, and eventually said the hell with it. This however, does not affect my continuing study of her works. Ahead of her time, able to delve in to the stupidity and slothfullness of government, and apathy of people in general, Ayn did well to predict a great deal of what we are facing today. I’ve been a re-reader of Atlas Shrugged for many, many years: Thank you Grandma Phoebe. Maybe one day you’ll re-visit it. reading cliff notes would defeat the idea of giving a whole opinion of a subject. The dictionary is a book hardly used (thanks to spell check) nor given credit to but its a must have. The book was published with the intent to educate not purely entertain. If that was the case i’m sure schools would maintain a better track record with drop outs and success rates, with the literature they provide. with all of us being apart of the instant generation (yes everyone in america no matter what your age) it only takes a chapter or two, to set the tone on how you will carry your emotions towards the actual reading of the book.